Websites can be great tools for reaching customers. The old fashioned business card design is still an important tool, though. Business cards are an inexpensive, concise way to make a first impression. Physical media can lend credence to your business in the eyes of your potential clients. Since I started my own freelance graphic design business in 1999, I have designed the perfect cards for a wide variety of clients. These have included a beautician, a business coach, and an auto body repair company. Whether it is slick and high tech, or simple and subtle, I can help you convey your business’s image. Your business isn’t generic. Don’t settle for a template. You need to employ a skilled graphic designer to do the job right and turn it around fast. 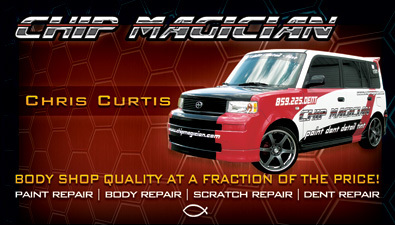 Contact me to get your custom business card design. I’ll make that first impression last! 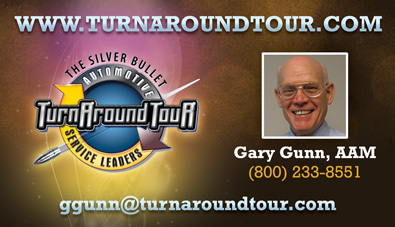 Gary Gunn, AAM, is a business coach who focuses solely on the automotive repair industry. Gunn began guiding auto repair shop owners in 1979, building trust ever since. He gave me my first big break in February 2006 when he employed me at his company, Turnaround Tour. I then transitioned to working for him on contract after I moved out of Bowling Green, KY in 2008. Through the years, we constantly improved and redesigned his web and print brand. This consulting business card design is a takeoff on my Summer 2010 facelift of the TAT website. During this time period, “bokeh” bubble patterns were a very popular design trend. First, I blended them into the brown grunge background, which also displayed on the website. Then, I highlighted the Turnaround Tour logo on the left with colorful lighting effects and mock fireworks. I set all of the text in multiple weights of the beloved and versatile Rockwell serif font. By using different colors, effects, and weights, I created a feeling of variety with just one font. The website URL and email address both use a light blue gradient effect, which adds prestige to the overall design. Finally, I dropped in Gary’s headshot, which was cropped square, for the last touch of personalization. I combined the trends of the era with timeless graphic design principles to create a fitting introduction to a mentor I admire. No rebrand is complete if you do not incorporate the right print media. The perfect business card will make a great first impression when you meet a new prospect. Would any new acquaintance visit your website if you were to hand them a subpar card? Contact me today so we can get started on your design right away! 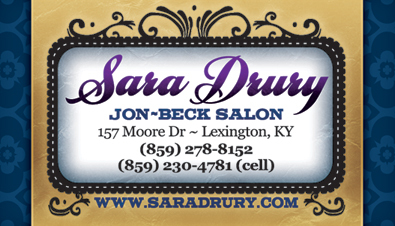 Sara Drury is a popular hair stylist and cosmetologist who is located here in Central Kentucky. After I moved to town in 2009, she contacted me for her beauty salon business card design. She needed a new design to convey her elegant sense of style, while still retaining the spunky aspects of her personality. Sara was very into the “shabby chic” style popular at the time. She asked to combine vintage style elements for an old school advertising feel. I obliged with components including the blue wallpaper pattern in the background and the flourished black frame highlighting the main text. The foreground items each display on a tan “scroll”, patterned to give the appearance of papyrus or creased leather. I heavily featured fonts by the Letterhead Fonts foundry on this beauty salon business card design. The LHF Tideway script font spells out Sara’s name in the main title. The title looks fabulous as it shines in a bold, purple gradient. I set both the words “Jon-Beck Salon” and her domain URL in a deep blue. Both of them use the LHF Mike’s Block font. I then wrote the rest of the text in Georgia. I used both regular and bold weights in order to enhance the classic feel of the overall design. Finally, I provided a colorful, stylish card Sara could pass on to potential clients. She also wrote appointments on the back of them for regulars. Their friends and acquaintances saw the striking cards, and they soon became regulars as well. Are you a hair stylist or barber? Perhaps you are a beautician who is in need of a fresh new beauty salon business card? You always make your clients look their best. 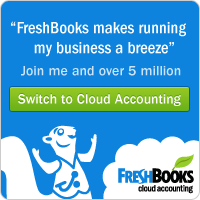 When you work with me, I will do the same for you. Contact me today to get started!